I've been relatively quiet about our SMS experience lately. We've found a fairly reasonable rhythm. We've largely accepted our lives as they are. We've found our SMS normal after 10 years of practice. It's not easy, but we're surviving, and even thriving at times. Finleigh turned 10 in February. Looking SO grown up. 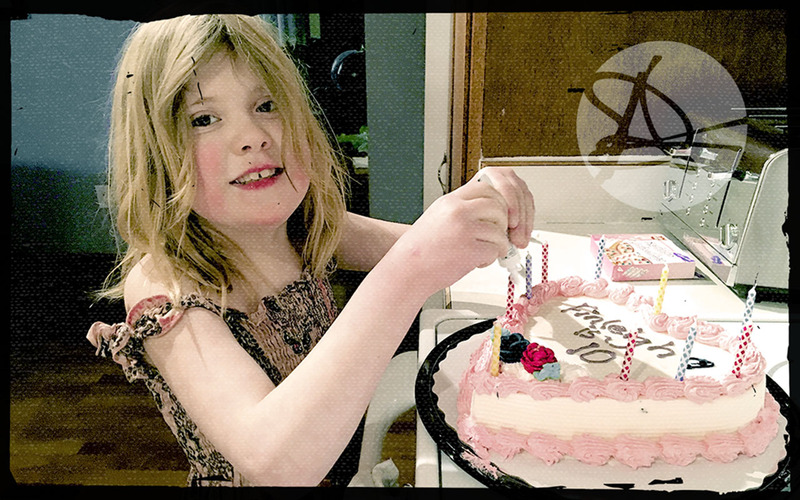 She helped decorate her own cake this year. Mr. Gecko was ripped from his perch and then partially eaten. Look close, can you see? This gecko from Puerto Vallarta. Hand made by artisans. Brought home carefully and lovingly because it reminded us so much of life down where lizards live. Geckos running up the walls, hanging out in their charming way. Well, they charmed me anyways. Which is why this little guy got his own wall... as if he was climbing his way to hide in the rafters. He's been there for a good 5 years. Adding colour to our home and making me happy every time I look at him. And then today... Easter Sunday... after getting up and hunting for chocolate at an ungodly hour, most of us us gathered to watch TV in the other room while Finleigh entertained herself in the room you see above. The room is full of toys, an iPad, a TV, colouring and craft paraphernalia, and is connected to the room where her basket full of chocolate is sitting. And whilst we were obviously being far to laissez faire for 8am on a Sunday morning, my darling, TEN year old daughter, climbed up, grabbed our beloved gecko, and began chowing down on him. 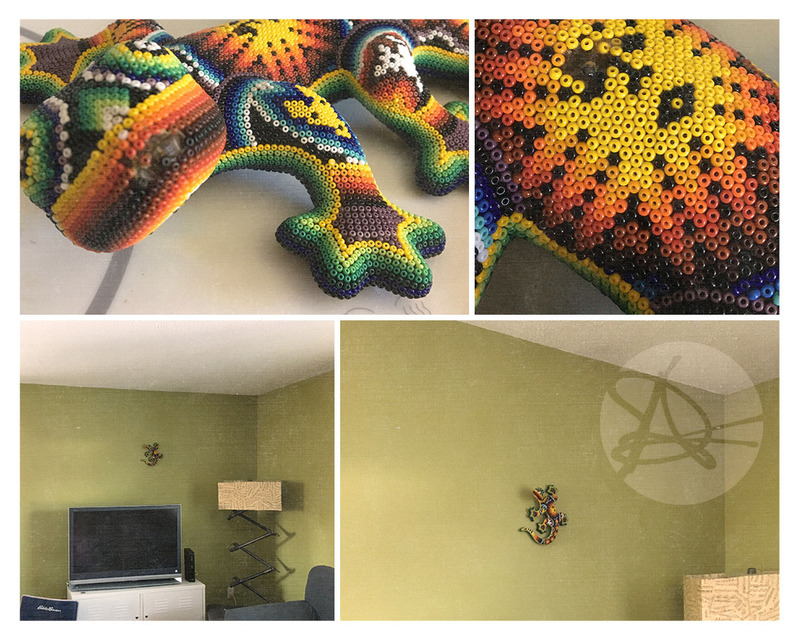 Yes, those are teeth marks on Mr. Gecko and we found beads scattered on the couch. We hope there was nothing toxic, because it's entirely possible that she ingested at least one of the beads, and who knows about the wax that the beads are attached by. I should be used to weird and crazy behaviour. I should be used to odd, ridiculous things happening, not just SMS related, but my whole life in general. Nary a day goes by where I don't roll my eyes at something. I seriously could not make this stuff up. But my gecko. "Safely" on the wall - with chocolate in every corner of my house - is the thing that get's eaten. oh Finn. Poor Mr. Gecko. Sigh. And so it is . . . love to all of you.